Smokey, the loudest cat in the world. Smokey the cat is an unusual critter. The 12-year-old rescue cat was adopted from a local animal shelter by Ruth Adams for her 10-year-old daughter Amy, but that’s not why she’s remarkable. Smokey the cat is unusual because of how she purrs. The Adams household in Pitsford, Northampton, is crowded with both pets and people (Ruth, Mark, and Amy are the people, and they have three total cats and two dogs), but Smokey is the most noteworthy because she’s the loudest. Smokey the cat purrs with the same decibel level as a hairdryer! 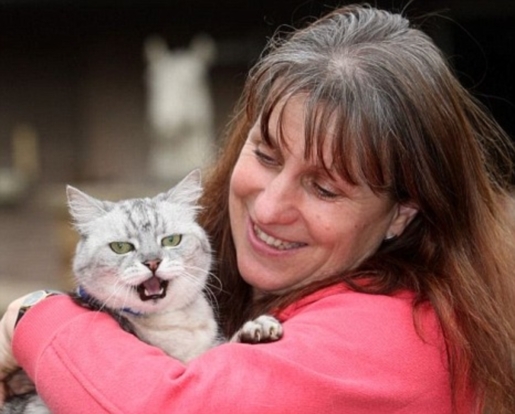 Most cats, including the other two cats in the Adams home, purr at 25 decibels. Smokey’s average purr is 80 decibels, with her highest recorded sound hitting 92 decibels, which is equivalent to the roar of a dryer. Smokey has been submitted into the Guinness World Records; the loudest human scream on record is only 129 decibels.